FAMILY LIFE: Male Yellow Spotted Amazon River Turtles court females by nipping at their feet and tails. Females dig shallow nests and lay between 20 and 30 eggs at one time. The incubation temperature of the nest determines the gender of the hatchlings. Females are born if the nest is warmer than 89 degrees Fahrenheit. Otherwise the turtles will be males. They hatch from eggs in 2 months looking like fully-formed adults about the size of a quarter. They begin to forage on their own just a few days after hatching. DESCRIPTION: Yellow Spotted Amazon River Turtles are named for the bright yellow spots seen on their heads which have a base color of olive green or brown. 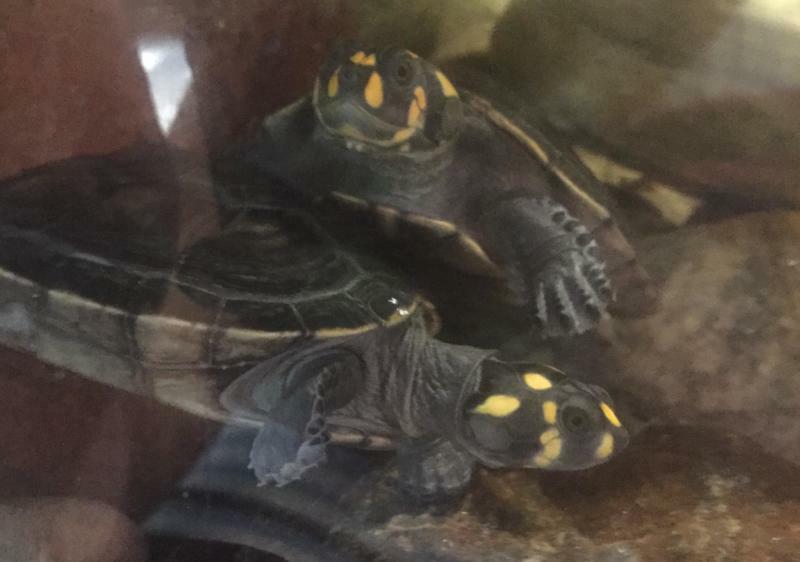 The yellow spots are most prominent in young turtles. The spots fade to almost nothing in females as they age but males retain the bright spots. The top shell (carapace) is domed and has a raised ridge in the center called the keel. The bottom shell (plastron) is yellow and may have dark blotches. Yellow Spotted Amazon River Turtles are also called the Yellow Spotted Side-necked Turtles because while most turtles retract their head into their shells, side-necked turtles have longer necks and they turn their heads into their shells. This does, however, leave them partially exposed. Female Yellow Spotted Amazon River Turtles are larger than males. Adult females grow up to 20 inches in length and 18 inches in width. Males grow up to 15 inches in the length and 13 inches in width. Females weigh up to 25 pounds and males up to 10 pounds. Yellow Spotted Amazon River Turtles are diurnal, meaning they are most active in mid-morning and afternoon. They have no need to hibernate in winter as they can withstand temperature fluctuations. RANGE: Yellow Spotted Amazon River Turtles are found in the Amazon and Orinoco river systems in northern South America but when the rivers flood they will branch out to the flooded forests. HABITAT: They live along the banks and in the waters of large, calm rivers and streams. They avoid fast-moving waters. DIET: Omnivores – Eat vegetation and small animals, such as, fish or mollusks. They also have an inertial feeding mechanism to extract fine particles from the water’s surface.